News reports have revealed the arrest of a woman for allegedly destroying her husband's car over cheating allegations. 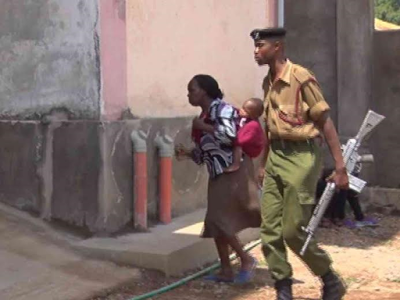 A Kenyan police officer arrested the woman identified as Joyce Kandie, today, July 19, for destroying her husband's car after catching him with his lover in Migori town. The reports reveal that Kandie had gone to Peter Murunga's house at Aroso estate in a bid to get help for their sick baby. Kandie claims that Murunga had abandoned his responsibilities since November 2015 when he reportedly began living with his lover identified as Susan Roki. "I have tried to have him take his six-month-old child to hospital without success. As you can see the boy is suffering from skin rashes and diarrhoea." She reportedly tried gaining access to Murunga's house during which time, her husband and Roki attacked her, leading to a fracas that is reported to have attracted a mob which destroyed Murunga's car, threatening to set himself and his lover ablaze. Kandie went on to claim that Murunga had attacked her often, leaving her with a broken tooth. Police also arrested Murunga and Roki and are being held at the Migori police station pending further investigation into the case.